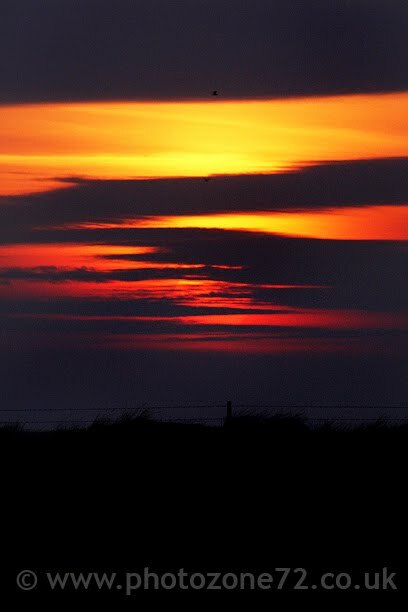 ...and all I got was this lousy sunset! Well, in fairness there was nothing lousy about it, it was absolutely fabulous! We did hear at least 5 Corncrakes calling although weren't able to spot any of them. 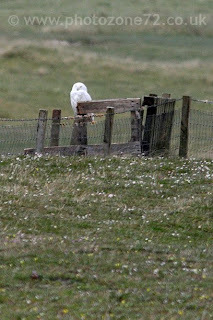 They are rather elusive little birds - we were actually delighted top even have heard them and there is no mistaking the sound. Their formal name is "Crex Crex" as you may know - because this is exactly the sound they make - it's been likened to a credit card being drawn along the teeth of a comb and this is quite a good description. 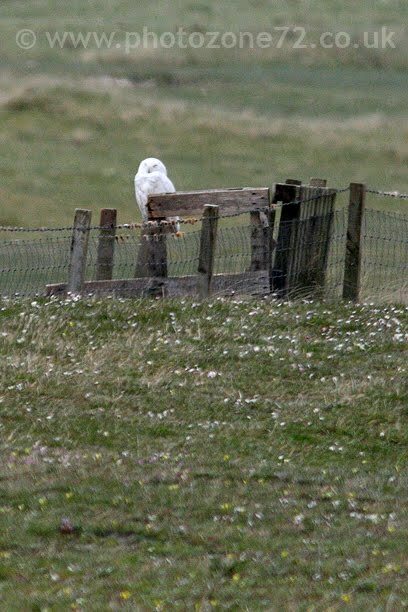 Bird highlights of the day yesterday were the Snowy Owl which has been creating much birding excitement on the machair at Grenitote, and a Snipe sitting calmly on a fencepost as we drove along the road yesterday morning. Not an entirely normal position to find a Snipe, but there you go - we turned round and headed back to make sure and yes, it was definately a Snipe! Today is about packing up, getting sorted out, and then spending the afternoon trundling around the places we enjoy the most before ending up back in the pub tonight to say farewell to Elisabeth, Alastair & Winston. The weather is glorious again so it's looking like a great final day. View from the cottage on a lovely spring evening.....Eaval clearly visible in the background. 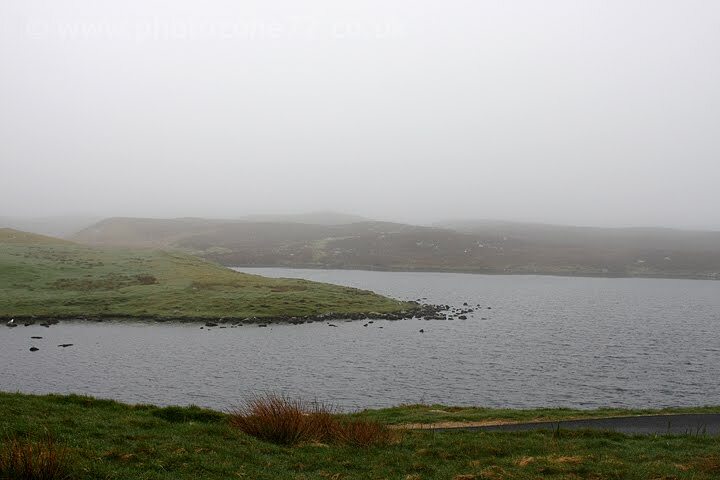 View from the cottage this morning - the white mist has descended and one of our hills appears to be missing...! 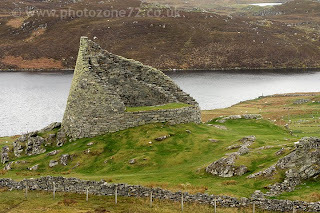 We headed bvack down via the western side of Lewis, hence passed by both the Calanais Standing stones and the Broch at Carloway, where the picture above was taken. 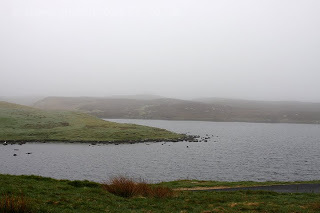 No sooner had we arrived there than it started spitting quite insistently with rain - making taking photos quite tricky as needless to say the rain was blowing directly at me! Managed to grab a few shots though, including this one which I think shows the fantastic and intricate construction of the broch fairly well. Amazingly you can not only go right up to the broch and walk around the outside,but you can go in and walk and climb through the remains also - astonishing and refreshing in this day and age. It means you can get a very real idea of how it would have been to be there in the past when it would have had floors and multiple levels. It's effectively a double skinned construction - the gaps between the walls have the stairs up to the various levels. Very clever and the workmanship is amazing. 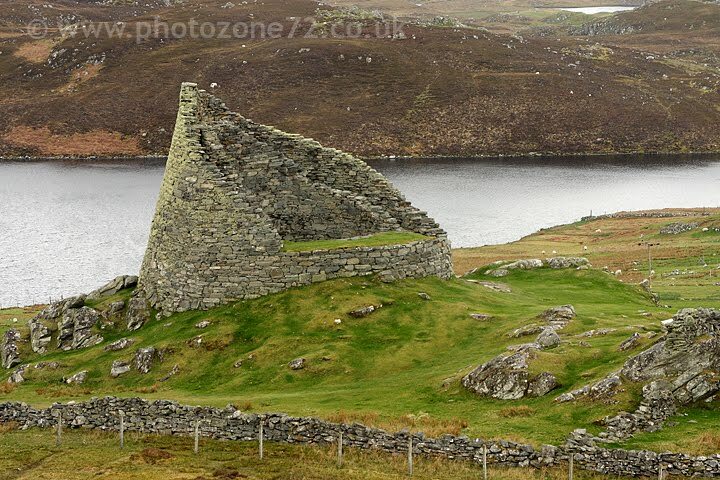 There is a good number of the remains of these Brochs around the islands but this is by far the most intact one. ...That is "Princes Strand" or in Gaelic Coilleag a'Phrionnsa - believed to be the place where Charles Stewart ("Bonnie Prince Charlie") first set foot on Scottish soil. Be that as it may it's a most beautiful place and always nice for a quick walk if you've time. 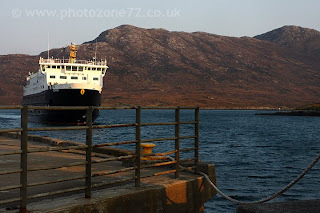 No chance for that today though as CalMac ferry Loch Alainn pulled up to the jetty and on we went. It's always fascinating getting an inter-island ferry - a lot more than just cars and people is carried - today it was the post for Barra (the flight times were wrong to allow the post to fly in directly, so it will have been flown to Benbecula and then transferred on to Barra via van & ferry), as well as a parcel from the South Uist Ambulance Service to the Barra one, via a helpful van driver! It was a quiet crossing, only about 5 vehicles going across and one fewer than than on the way back. 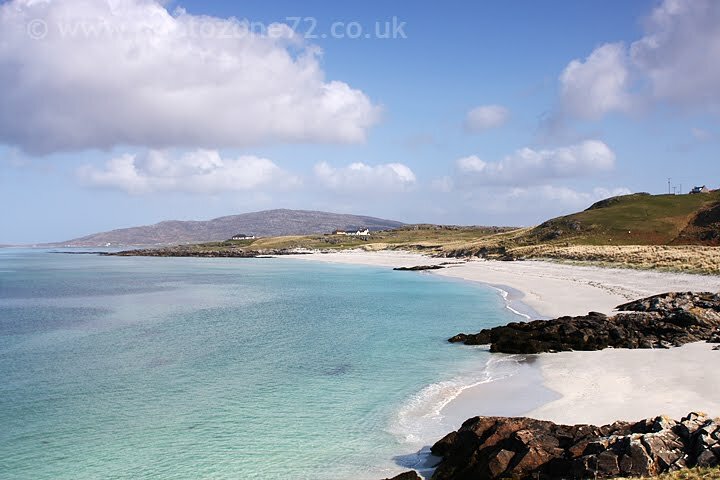 Barra is a beautiful island, and you also have Vatersay to explore as they are linked via causeway. We sat and ate lunch on Vatersay on the most amazing beach - it was incredibly warm, the sand was so white it almost hurt the eyes and the sea was a perfect shade of turquoise! Bliss! 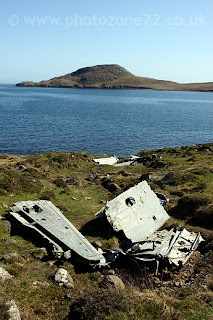 We then went for a look at the wreckage of a Catalina plane which crashed on the island during the second world war - incredibly it still lies where it fell, there is now a small memorial for those who lost their lives which is nice to see. Anywhere else if it hadn't been removed by the council ('Elfen Safety you know!) it would have been stolen by treasure-hunters, but on Vatersay it is treated with respect and left to lie. There is a circular road running around Barra so the easiest way to see the whole island is to drive around that. We walked around it once - it's 14 miles, and our feet were fairly sore by the time we got back to the starting point! Today though Gracie took the strain, obligingly stoppoing time and time again for us to look at something, or take photos, or identify birds. 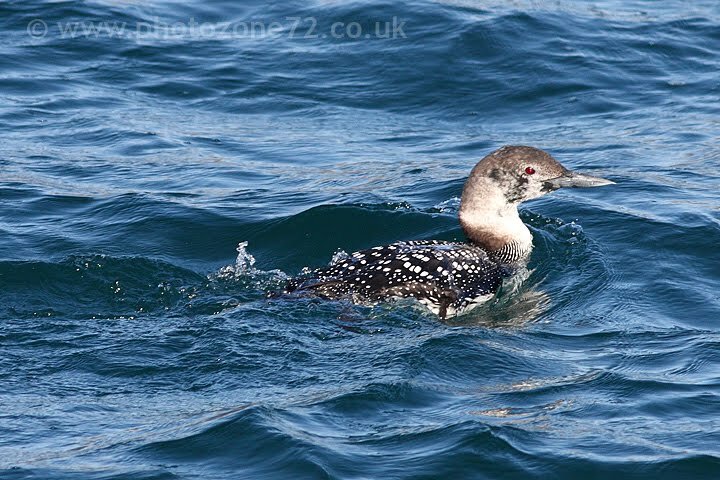 We saw a pair of Linnets which was a first for both of us, and, on the crossing back, masses of Great Northern divers just changing from their winter plumage - I'll leave you with one of those! 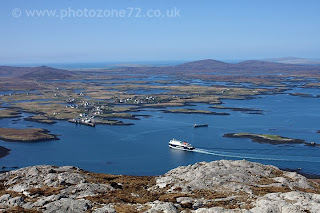 Tomorrows photo may be recognisable to any of you who watched the recent "Island Parish" series on TV - as we are off to Barra for the day via the ferry from Eriskay. I haven't decided what the photo will be yet - maybe Kisimul Castle, Maybe Father John-Paul's Church of Our Lady, Star of the Sea. Maybe something else entirely. we'll see! 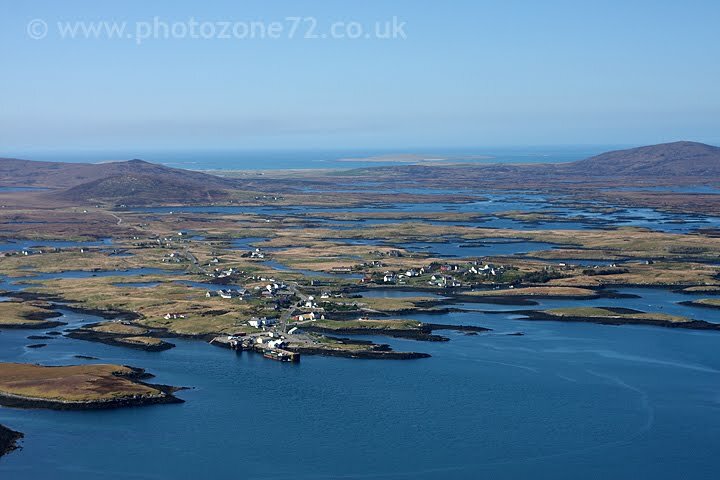 This is the "South Ford" between South Uist and Benbecula. We sat and ate our lunch today and looked out across the ford, as you can see it was a gorgeous afternoon again (this morning wasn't quite so cheery but as it brightened up so nicely we'll forgive that) and there were people out on the ford walking dogs, or just walking. It wasn't until 1942 that, if you wanted to cross from one island to the other you had no choice BUT to walk, as it wasn't until then that any form of crossing was put into place! 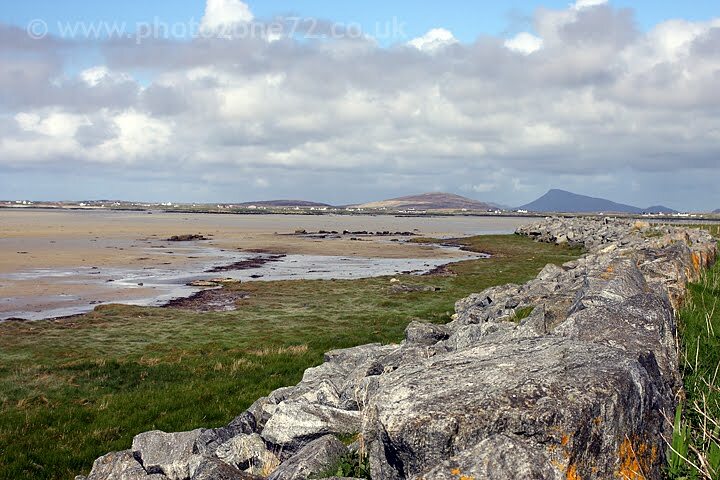 Now the causeways are commonplace - the longest being the North Ford Causeway beween Benbecula and North Uist, via Grimsay, however it took nearly another 20 years for that one to be built. Prior to that you could, at high tide, take a boat from Carinish to Gramisdale, or at low tide in good weather the crossing could be made on foot with the assistance of an experienced guide - however there was 4 miles to cross, and was only open for one hour each side of low tide! 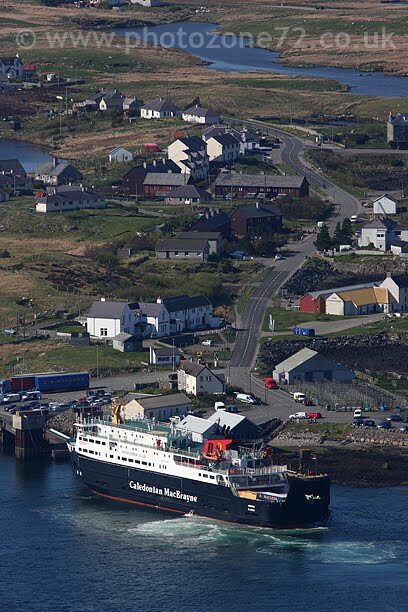 The most recent causeway to be built links Eriskay to South Uist, and was only completed in 2002 - isn't it incredible to think that prior to then, this fairly well populated island was entirely reliant on a ferry service. 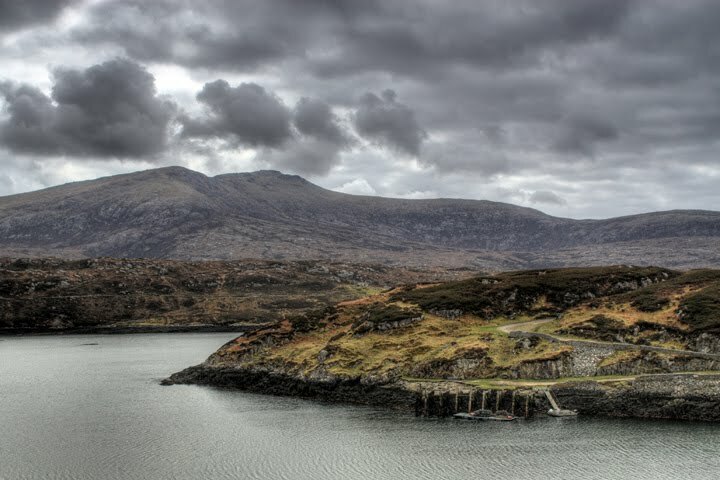 Thanks to the "Spinal Route" consisting of roads, causeways, bridges and ferries (Crossing the Sound of Harris and between Eriskay and Barra) it is now possible to travel by car in a single day from Ness at the North of Lewis, down to Vatersay to the south of Barra. 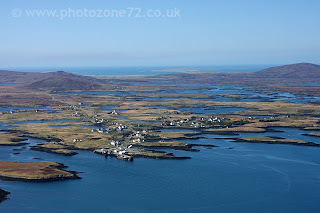 We think little of popping down to Balivanich on Benbecula for diesel as we did today (although when we got there, at 154.0 per litre we thought a bit more!) and it's incredible to believe that relatively little time ago that simply wasnlt an option. ...but from a slightly different angle. 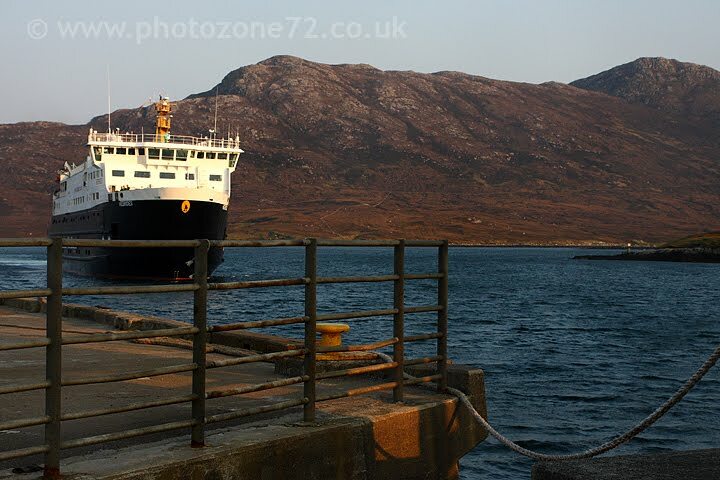 it is effectively the polar opposite of one of yesterdays pictures, which was looking down on Lochmaddy pier from North Lee, at MV Hebrides coming in to berth. In the picture above you will notice the point we were sitting when yesterdays shot was taken can be seen just above Hebrides port side bridge...! We came to be there to meet her this evening as the handpump problems at the pub turned out not to be immediately easily fixable, and parts were required. The parts of course were on Skye at the brewery, but a simple call to the brewery confirmed that they had the right bits, and a method was found of getting them brought across on the ferry this evening meaning we simply had to meet the ferry, collect the bits, and then take them to the pub to complete the repair job. Ahh, but things are never that simple are they? You're anticipating a story of how it all went wrong! Do you know, it didn't - over here, things like that are surprisingly simple. Sadly the days of Calmac being happy to take stuff on board to go over without prior arrangement and forms in triplicate are long gone, but there is usually a friendly van driver coming across who is happy enough to have one more item added to his load. People here are used to such things, it's the way life is, and how things continue to function. We usually bring across any bits and bobs from the brewery for the pub - we'll be going there in any case so it's no hardship, and it saves the risk of them getting mislaid by a courier. (The pub is currently missing a door - it's over here *somewhere* but nobody seems quite sure where at the moment. It'll turn up though.... eventually.) From our perspective, we had a nice meal while waiting for the ferry, met people we knew whilst waiting for her to arrive and had a good chat, then collected the bits and got given beer a reward! What more can you ask?! Today was yet another fine day (unheard of! All this good weather coming at once! It'll be a terrible summer now, you mark my words!) so we set off for a walk that Ben has been talking about for quite some time, and I was viewing with a level of trepidation. You will already have guessed that a hill is involved I'm sure - this time it was North Lee - one of the higher hills on the island. So - todays blog (which should have been yesterdays, but we were busy yesterday evening so it didn't get done!) is a multiple picture one showing some of the views on the walk in, and way up, plus a shot or two of the incredible views from the top. This is the view from where we started. North Lee is on the left (we climbed to the highest point on the ridge on the left of the hill - this gives the best views and that was what we'd climbed for, so there seemed little point in going on to the "real" summit! Plus, we were shattered by then!) The hill to the right of it is South Lee. This was marked on the OS Map as a "Sheepfold" and is basically a stone walled enclosure where I presume the sheep can be safely held in case of poor weather, or lambing, or simply checking them over. It appears to be unused now. You will notice the hill peeping at us over the top "I'm still here you know!" 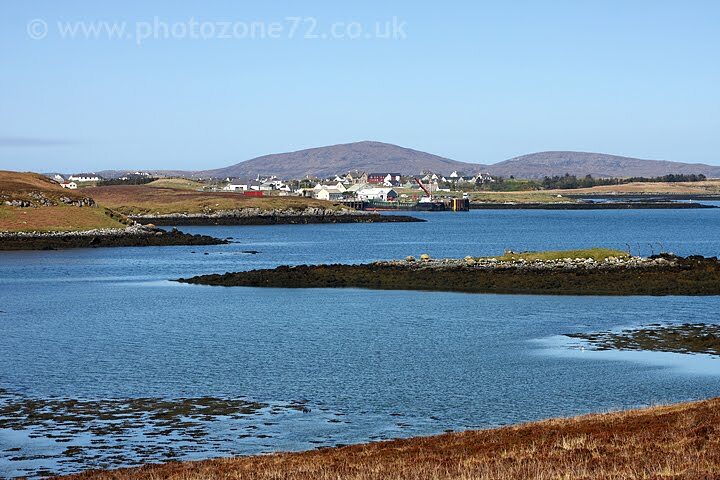 Lochmaddy Village from the foot of the hill - you can see the Calmac Ferry Pier in the foreground, and the village stretching off behind. 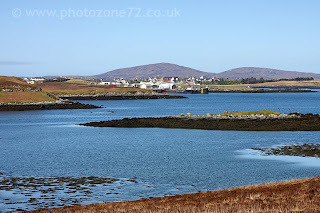 Lochmaddy is nominally the "Main" vilage on North Uist - but there isn't an awful lot there! A couple of hotels, a shop, an arts/community centre which also houses a cafe and Post Office, and some houses. And the ferry terminal of course, which is really the main reason for the Village being as large as it is. So - the climb begins. 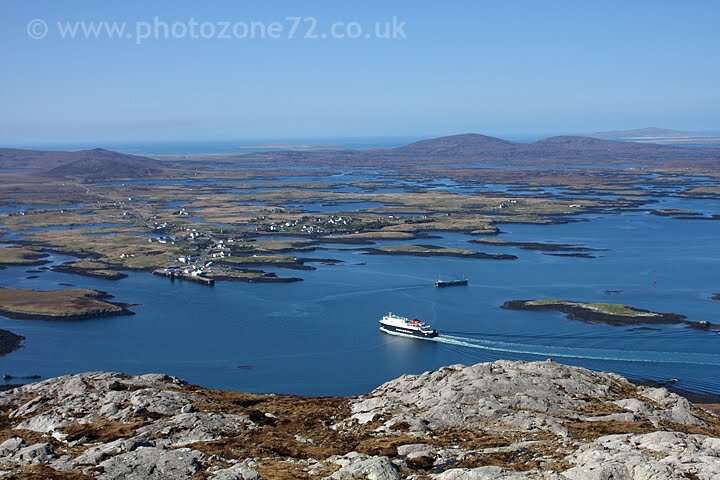 This next shot shows the view across to Lochmaddy again from around half way up. Already it was beginning to be apparent just HOW god the views were going to be from the top - by this stage my legs were screaming and I was beginning to get distinctly short of puff, but there was no way I was giving up! The Top! 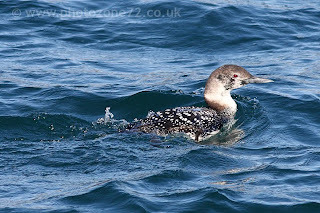 At this point, as well as Calmac Ferry MV Hebrides (Also blogged recently by Donnie McKay over at HIS HEBPHOTO BLOG although in a slightly different surrounding!) we could see across to Skye behind us, and over the Berneray and Harris to our front and right. The rest of the chain of Islands making up the Uists stretched off to the front and left. More "view" pictures will make it to my Webshots album in the next few days I'm sure. 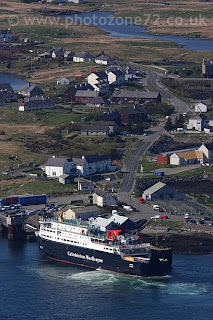 "And, finally..." as they say on the news, MV Hebrides safely in to the pier and getting ready to disembark what looked like a full load of cars as well as a few commercials. We could hear the tannoy announcements on board quite clearly and it was very strange to be sitting up a hill listening to announcements telling all drivers and passengers of cars on the main deck only to please return to your vehicles! The views were phenomenal. The climb, and the walk, were extremely tough going. We reckoned the distance there and back at about 8 miles, but it's the terrain that makes it such hard going, there is never a straight route to be taken and even on the hill itself you constantly find your path blocked by a boggy patch just TOO wet to pick your way through, or a sheer rocky drop that has to be got around. Would I do it again? Yep, probably! 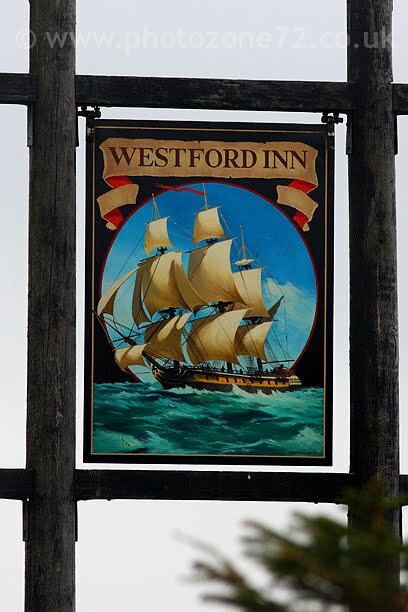 The wind has now come up again - and we are shortly off to the Westford to help Elisabeth & Alastair getting ready for their re-opening later today. There are handpump problems, which coincidentally are right up our street....! ps: Oh, I'm sorry, the glove? You want to know about the glove? Ahh, well, I have a problem at the moment with one of my gloves trying to escape. It constantly makes its way from my left hand coat pocket to head off and find adventure. On this occasion we thought it lost forever as it was lost "somewhere" on the walk in to the hill. We must have done a god job retracing our steps though as on the way back, suddenly, just to our left a small fluffy purple dot was spotted - and there it was! The silly thing was snuggled safely back in the pocket and zipped in, just in case it hadn't had enough adventure for the one day you know! Another day of glorious weather today - the sun shone nearly all day although there was a hazy cloud layer present as well. We keep being thanked for all the fantastic weather we've "brought with us" as apparently most of the year so far here has been grey, grey, and grey some more! 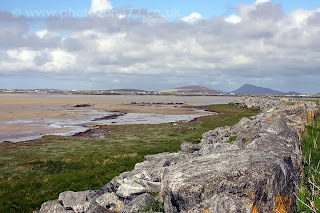 We knew we didn't want to stray too far from home today as we had plans to see friends for a meal this evening, so we headed round to Hosta on the west of the island for a walk. The intention was to find a natural rock arch that we had read about, but there was no sign of anything like that in the distance we went. 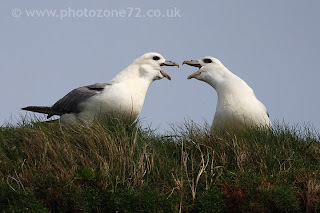 We did come across a small colony of Fulmars though - seemingly unperturbed by our presence and quite happy to fly around us showing off, before landing back on the nesting area on the cliffs. They were also quite happy to have their photos taken! Plans for tomorrow are "wait and see" at the moment, although the excellent XC Weather site tells us that another day of good weather is expected. 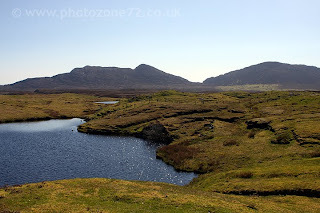 We have in mind several walks that we fancy doing, so it might well be one of those - there are hills that we are hoping to climb also but that depends on me feeling brave enough to tackle them! By the way for anyone as curious to know what happened to the group of walkers we alerted the Coastguard to the other night - the answer can be found via This link - nice to know they were all OK! Hurrah! 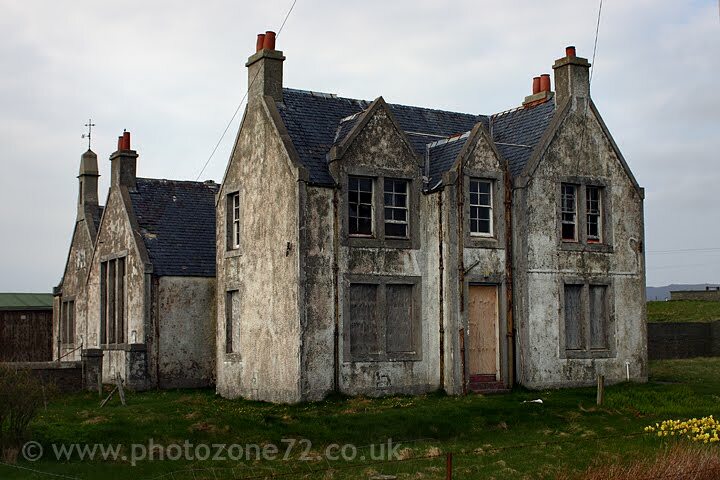 Three days here - it must be time for an "Abandoned" shot! Todays building is the old school at Lochboisdale on South Uist. I had an altogether different building in mind for this until Ben commented how much he'd always liked this one and what a fantastic building it is. Looking at it I think you will have to agree that he's quite right - it's so sad that such a fabulous building has been taken out of use, it's only just over 100 years old but sadly the islands dont require so many schools as they used to - the fashion now is for fewer schools with more pupils in each, so the children of primary age from Lochboisdale now, rather than trotting up the road to their very own local school, have to travel around 4 miles to the primary at Daliburgh instead. As they get older the travelling time gets ever greater. Bird of the day today would have to be the Short Eared Owl that flew right in front of us earlier on - so close we got an excellent look at him! A day of peaceful walks and high drama! 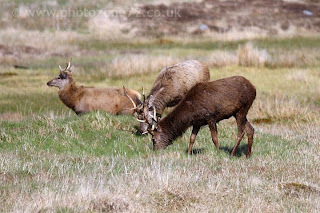 Well not quite the bird I said you might get, but wildlife, of a sort! 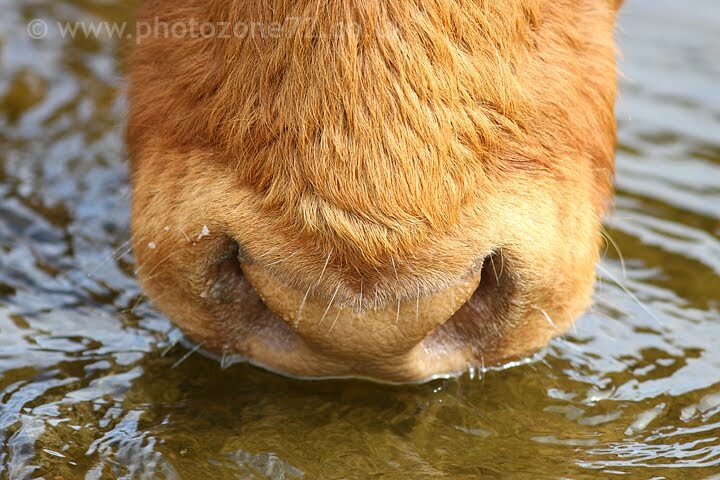 This cow was drinking from a puddle at Balranald RSPB reserve earlier today. I had the long lens on the camera and didn't want to change over to a standard zoom, so had to think laterally! 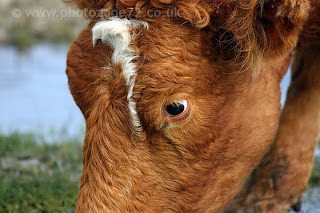 There is one of it's eye too - you may get that in due course if I end up with a photo free day! That was the peaceful walk - a lovely stroll around Balranald earlier on. It's a fantastic reserve with "a bit of everything" - the machair, (google it!) beaches, rocky coastlines etc - and is by far one of our favourite walks when we are here - we will almost certainly go back at least once more yet, maybe more. 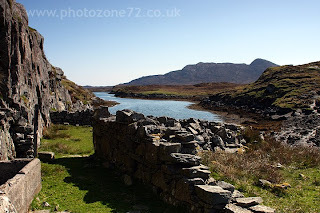 We followed that with lunch at the Claddach Kirkibost centre (fab lunches!) 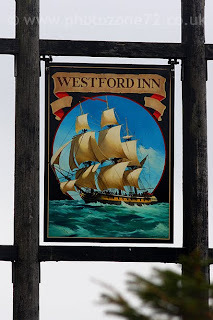 before calling into the Westford Inn to see Alastair & Elisabeth. The pub has been closed for refurbishment over the winter and my goodness have they done a lot of work to it! It looks fantastic, and will be reopening on Friday this week as - as Elisabeth says - "just the sort of pub that WE would like to visit!" Hurrah! Hopefully the fantastic pub sign will be going up at the end of the week too - as and when it does I will definitely put a picture on here! 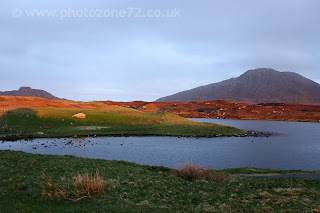 Once we finally got back to the cottage I chucked a chicken in the oven for dinner before we headed off for a wander to the roadend, as Ben missed out on a stroll up there the other night and we were hoping to see the otters again. On getting there there was no sign of otters, but we decided to continue walking to check out the stepping-stones which form part of a walk we are considering for later in our stay. They are about a mile past the road end, we had no map but as we knew the path we didn't worry too much. Once we were a few hundred yards short, but still out of sight of the loch the stones cross, we could see people on the other side presumably about to head back, so almost turned back as we figured that they were definitely passable....but decided to continue because as Ben said, it would be nice to see HOW passable. The answer was clearly "Reasonably, but only at low or medium tide - not the high spring tides we have these few days, as the party of walkers (several adults and about 6 kids) were firmly trapped on the other side. On seeing us one of the chaps with their party asked if we knew of a bridge, to which we responded that there wasn't one - nor was there any other reasonable route for getting back to the road. We estimated that it was going to be a good several hours before the tide abated enough for them to cross - the children were already getting cold and frightened and the chap we were talking with was starting to talk about wading across.....we hastily urged him to under no circumstances even try, as the current flows so swiftly there on an incoming tide there would be no chance of making it over without getting swept away. 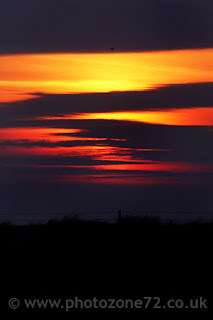 With only an hour or so of daylight left we decided there was no time to lose and pegged it back to the road-end where there is a phone signal, and called through to Stornoway Police who alerted the coastguards. At time of writing (two hours later) the three coastguard vehicles have just returned up the road, followed by the three cars belonging to those who were in trouble, so it's reassuring to see that all has ended well. Us? We're having a well deserved beer! 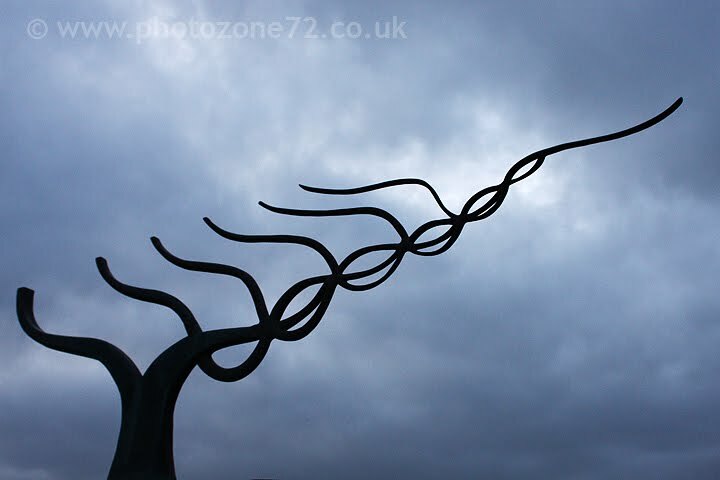 It's been a mixed day today - this morning was grey and a bit gloomy, it rained for a while and we were in no hurry to get ourselves ready to go out, however once that had blown over there was clearly some brightness waiting to get out from behind the clouds. 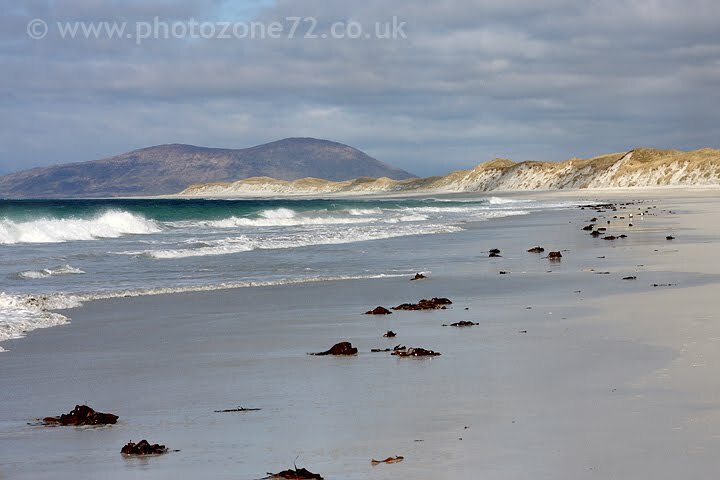 it finally made it mid afternoon - and was perfectly timed for a walk on one of our favourite beaches on the island of Berneray - 3 miles of perfect white sands and often not another soul to be seen. (Today there were two other souls, but hey, that's not bad for 3 miles of it!). 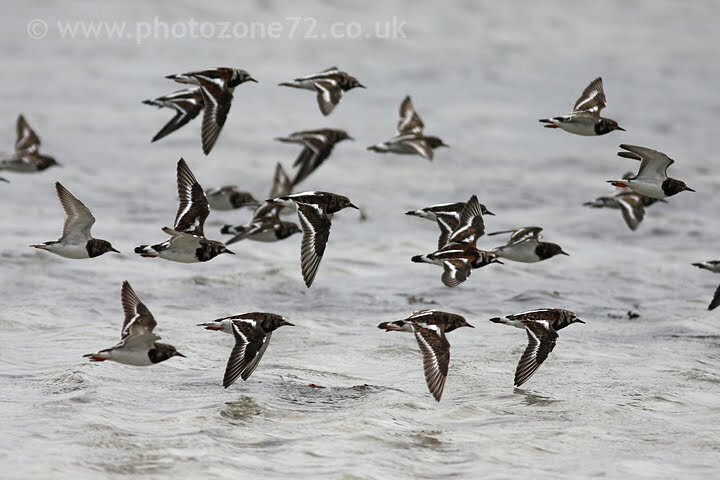 A regular feature of many of our beach walks are the huge flocks of various different types of wading birds that can be seen. Today we saw Purple Sandpipers, Ringed Plovers, Sanderlings, Oystercatchers and also a Dunlin, as well as the Turnstones pictured above. Funny little birds - they can be quite happy one moment picking their way along the shoreline turning over bits of seaweed and - funnily enough - stones, to see what tasty morsels they can find. Then, with no warning at all something startles them and they all take flight and land again some distance off down the beach! 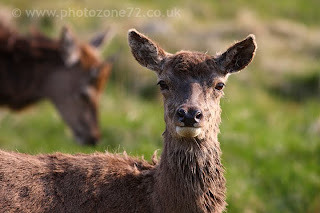 Sometimes in fairness it is one of us trying to creep up unnoticed with camera in hand that alarms them, but on most occasions it's something completely unknown! 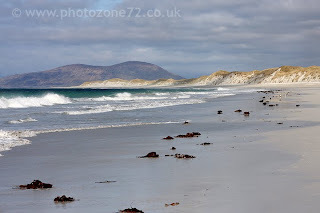 There you go - just for Auntie D - West beach, Berneray. Now wouldn't you just LOVE to be walking along there?! The end of the road, that is. 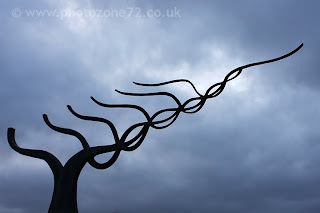 A few years ago some local artists got involved with a project which was called the "Roadend Sculture trail" - so there are now 5 or 6 of these rather unexpected sculptures to be found around the islands. The common theme is that they are all supposed to reflect the landscape & community in some way, so for example one is a bench in the shape of a wave, tiled in blue/green tiles which were created by the children at one of the local schools. Another is caled "The Listening Place" if I recall correctly, and features a semi circle of seats all of which are made from old tractor seats. When you sit there and listen what you hear is perfect, amazing silence, so loud it is almost deafening.... The one above is our favourite - it can be found at the end of the road we stay on, and this evening after we had unpacked, been shopping, had a chat with Alasdair (owner of the cottage) and made a fuss of his dog, (Who thinks her name is "Sheila-get-down"!) Ben collapsed into a well deserved heap on the sofa with a book, and I went for a walk up the road to clear my head, enjoy the peace and quiet, and reaquaint myself with the surroundings. We're crossing our fingers for some good weather - it's been very grey and dreary here over the past few months apparently but the general opinion is that the incoming high pressure should mean a change now - certainly at the moment the forecast for the week to come is amazingly good so please keep your fingers crossed that it stays that way! Regardless though, we have a cosy cottage with amazing views to stay in, beer in the shed - and the fridge - and are thoroughly looking forward to our time here. 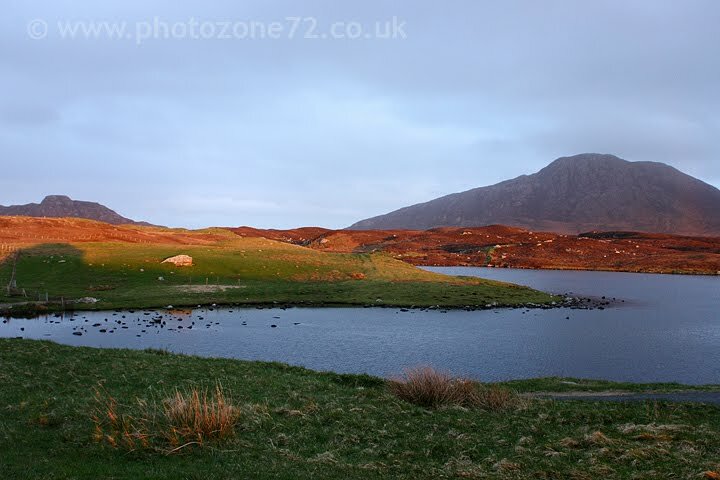 A picture from back in 2007 for you this time - remember the Old Pier at Loch Skipport? One of our favourite spots and I have posted shots of it before - it's always fascinating seeing how it has changed from our last visit as the weather is battering it badly these days. This is a slightly different view of it though, as it was taken from the opposite side of the Loch. This walk is one of several we have a fancy to either re-do, or have a go at for the first time this year. My lovely other half has at long last convinced me to possibly have a crack at one or other of the "significant" hills, so dependant on conditions underfoot we might climb or other of the Lees. We'd like to do that walk from North to South Glendale again - this year I intend to try not to end up to my knees in boggy mud! 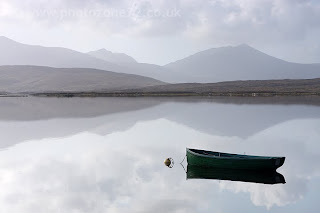 The next time I update this will be from the Hebrides - so if you have any requests of things you'd like to see photos of then leave a comment and let me know. Auntie D has already told me "lots of beaches" so I shall do my best on that front - no doubt there will also be some birds, although we're still not birdwatchers. Nope. Definitely not.